No, not the ELO that will be inducted into the Rock & Roll Hall of Fame next April, but a light and sound show happening here in Fernley. I saw on a local group a notice about it and last night Lisa and I drove over to the location to look and listen. They have a low-power FM transmitter (with a sign saying to which frequency to tune). Parking across the street gives the best view of the coordinated music-light show, but the transmitter's power is so low that only certain spots pick up the signal. 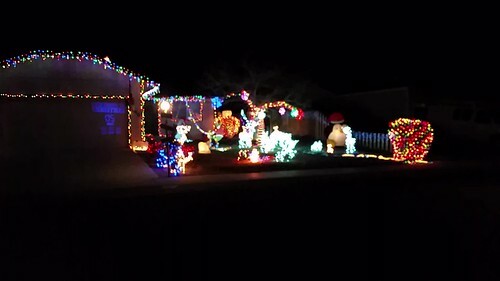 I found this entertaining, but as it's been up since Thanksgiving, Lisa says she thinks the neighbors have had to invest in heavier curtains.